The long awaited and highly requested meal prep ideas are HERE! Meal prepping has been how my hubs and I have survived being parents to two big eating, constantly munching, never full chunks while not having gone hungry ourselves! While our chunks sometimes can be referred to as human garburators, they are extremely picky and have completely opposite taste palates! Jackson (almost 5 now) loves sweeter foods like french toast or oatmeal with berries and will not go within a mile of meat, pizza, rice or anything savory. Maddox, on the other hand, will have a nice big plate of oatmeal with apples and cinnamon and he's reaching over the table to grab a drumstick off his dad's plate. This has meant that in order to get these two picky chunks to eat, most of the time we're making a couple different meals at a time. For survival and ease, we have been prepping our meals for the last 3 or so years and have come to LOVE it. We tried the whole make a new dinner meal every evening thing for a while and we ended up always grabbing something quick because we had somewhere to be or we were just too tired from the day, which lead to unhealthy eating and causing us to not keep our fitness goals in check. I personally meal prep lunches and dinners every week and have no problem eating the same things repeatedly. However, you can make a few different meals and change it up as well! Again the reason behind meal prepping is to make your life easier so you can spend more time enjoying what you love while also enjoying your food! These are just the first of many recipes I will be sharing on the blog so relax and enjoy the ride! I want to make something clear though... I am NO CHEF. I actually am not a good cook but these are some recipes that I have found I can make without burning or screwing it up, so feel free to add whatever spices and veggies you'd like and use these as guidelines! Bon Appetite! This may sound like a fairly easy and simple recipe and guess what - your absolutely correct! Which makes it ideal for meal prepping and the best thing about it folks? 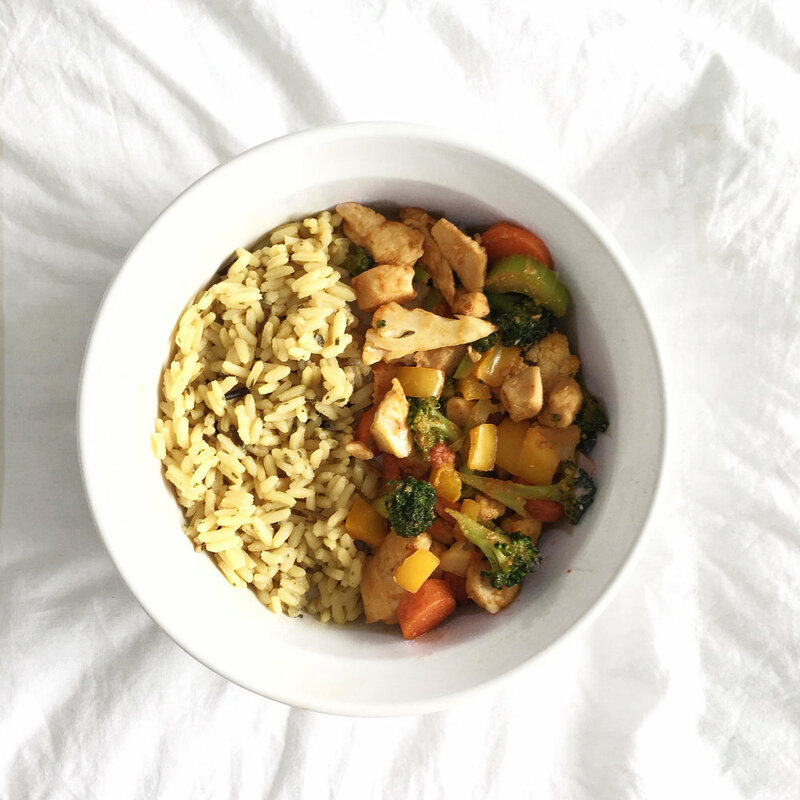 You can change it up every single time by adding different vegetables and spices! 1) Cook rice as directed on package. 2) Cut up chicken breast into small pieces. I like mine super small so they cook faster and blend with the vegetables better. Cook it in whichever oil you think is best until it is cooked through. Add the desired amount of garlic powder and chili powder to the chicken and stir to combine. 3) Once the chicken is cooked through, add about 1/4 of a cup of chicken or vegetable broth (does not have to be exact) and add chopped vegetables. Stir and combine with chicken until all vegetables are nicely coated with a thin layer of the broth. Place lid on and turn the temperature to medium heat to steam and soften the vegetables. 4) Once the vegetables have softened to the desired amount, add spices of your choice and sriracha sauce (if desired). Some spices/sauces that seem to work really well include basil, ginger, tamari, and sweet chili sauce. 5) Combine with rice in containers and your lunches or dinners for the week are complete! SO EASY and delicious! Enjoy! This is a tasty and once again easy recipe to make for your entire week! 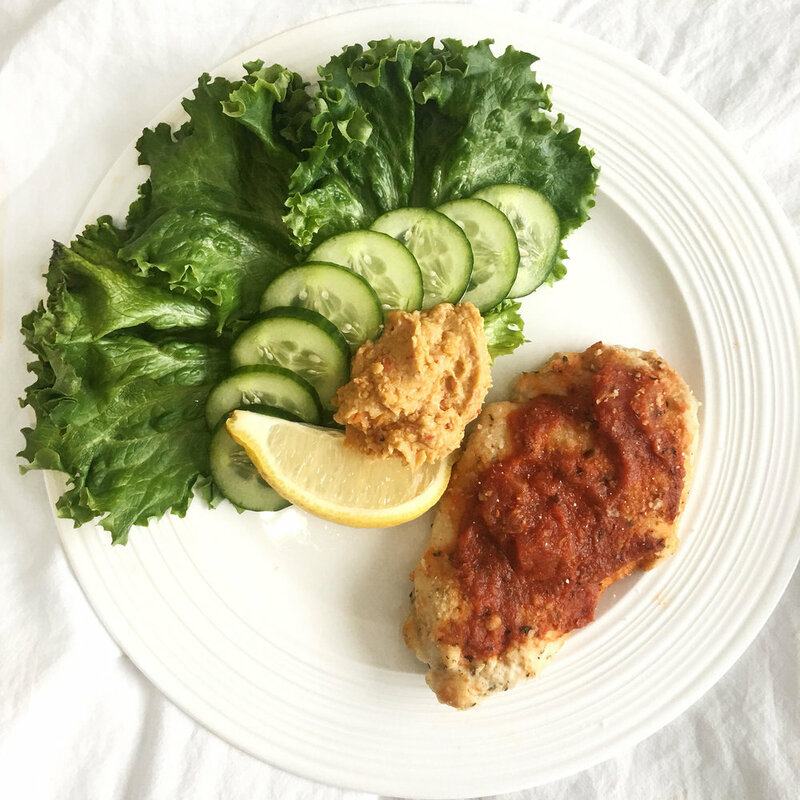 Low in carbs and high in protein and nutrients this meal is so easy to reheat and maintains its yummy goodness! Also, if the lettuce wrap idea isn't what you want all week, add quinoa, rice, lentils, or whichever you prefer and you've got a whole different meal by just adding one ingredient! 1) Pour a dash of oil of choice into a skillet. Add finely chopped chicken breast and cook through. 2) Add carrots and a bit of water or broth of choice to steam cook the veggies. 3) Add all other vegetables and spices and cook until desired texture. 4) Pour over a few lettuce leaves or carbohydrate of choice and enjoy! This recipe for us is an oldie but a goodie... and a must cook for fall/winter seasons! This is so easy, so tasty and does not disappoint even after a few days in the fridge! Feel free to mix up the veggies, I typically base my choice on the season and what is growing and cheap! During the winter months, I stick to roasted beets, sweet potato, white potato, and carrots but I switch to steamed asparagus, broccoli, peppers etc. during spring and summer to spruce it up or I add a side salad or raw veggies! 2) Cut chicken breast in half lengthwise to keep it thin. I find it cooks better this way and quicker! Put some breadcrumbs into a bowl and dip both sides of the chicken breast into the bowl coating it in crumbs. 3) Lay chicken breasts flat on a baking sheet lined with parchment paper. 4) If roasting veggies, peel and chop all vegetables into small cubes, place on a baking sheet and coat with a dab of olive oil and spices of choice. 5) Put both pans in the oven for 12 minutes. Flip. Put back in the oven for another 10-12 minutes until chicken is cooked through. 6) Depending on which veggies used you can take them out at this point or give them a few extra minutes. Remove chicken from oven and add a tablespoon of pasta sauce on top and cheese if so desired and add it to the oven for an extra 5 minutes. Once that's finished, divide into containers for the number of days needed and voila! 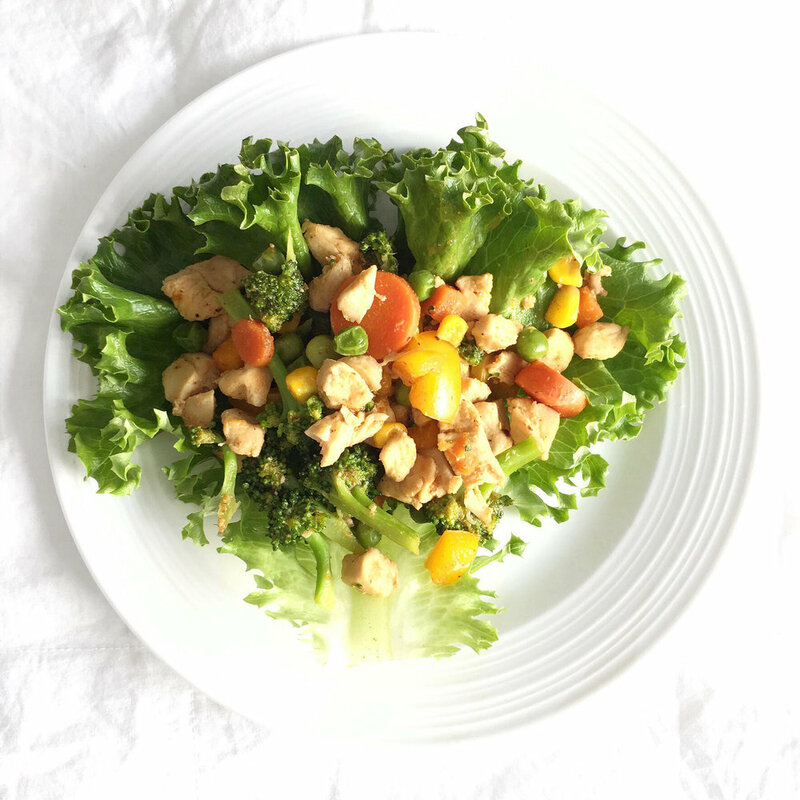 You have a delicious foolproof chicken dish ready for the week! I have also served this with pasta for guests and they have quite enjoyed it! I hope you have enjoyed these simple yet delicious recipe ideas! Comment bellow if you try any of these and tell me what you think! I will be doing more of these so comment bellow if you have any requests or ideas! I have some vegan and vegetarian recipes I can share if desired as well - let me know what you want to see! Happy meal prepping!